Day 103: The Big Boom! Posted 11 January 2011 in Day Entries, Earth, Events, Jimmy Olsen #138. Call it what you will — Blow-Up! Doom-Time! Holocaust Time! The Big Boom! 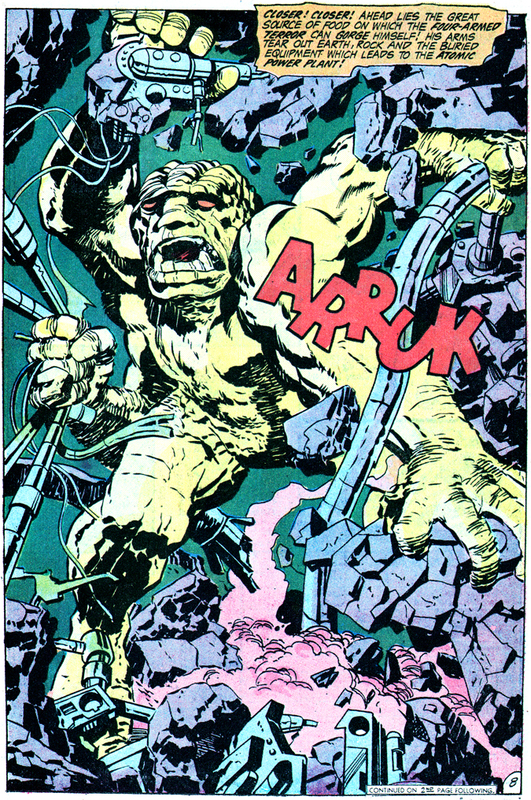 — but it sure looks like the end of our heroes, The Project and all of Metropolis when The Four-Armed Terror, looking to munch on raw atomic energy is wrecking havoc with the facility’s atomic reactor, and Kirby builds up the anxiety as deftly as Hitchcock throughout this nail-biting issue! Somewhere, in their hidden location, the operators of the “Evil Factory” follow the creature’s progress! Simyan: There’s the blip! Our fledgling is in the main conduit! Mokkari: He must feed on radiation! He’ll rip that pile apart and trigger a chain reaction! Then a great white flash! A fire storm of indescribable heat! Shock upon shock as a mushroom cloud rises where once The Project stood! A job well done, eh, Simyan? Simyan: It will be beautiful, Mokkari! And with it will go the rest! Yes — and even the city of Metropolis — which lies above, within range! We’ll have carried out, to the letter, the order of our great leader, Darklseid! Surely this is a triumph for the forces of our world — Apokolips! The pattern is set! We have bred the perfect instrument to challenge humanity! Mokkari: Sprung from their own seed — and nutured by radioactive vapors! Simyan: The others are stirring! They’re breaking free of their protective shells, Mokkari! Mokkari: It is their time, Simyan! Their birth heralds the age of holocaust! Hail Homo Usurpus! Earth lies before you for the taking! The final countdown is on! It isn’t waiting for Jimmy Olsen, his pal Superman, or for any of us! So stay where you are — on Ground Zero — so you won’t miss the following issue — and the Big Boom! That closes JO #137, and the next issue opens with pandemonium at The Project. The opening caption reads: “The End of the World is at hand! But who would believe us!!?? You would! — If you knew what was going on, underground, in the world of The Project! Down there, it is fifteen minutes to The Big Boom! !” A commanding officers barks orders to his soldiers, “Snap to it, men! You know what our scanners show!” One says, “Yeah! Wow!” and the other, “It’s holocaust time at the atomic power plant!” Coming right at us on this opening splash page are the Guardian and the original Newsboy Legion wielding pistols. Tommy, Sr.: Our rival project, the Evil Factory, has turned loose a destructive D.N.Alien in our area! Flippa-Dippa’s Dad: Superman’s trying to head him off! But he’s run into trouble! Big-Words, Sr.: Let’s go! 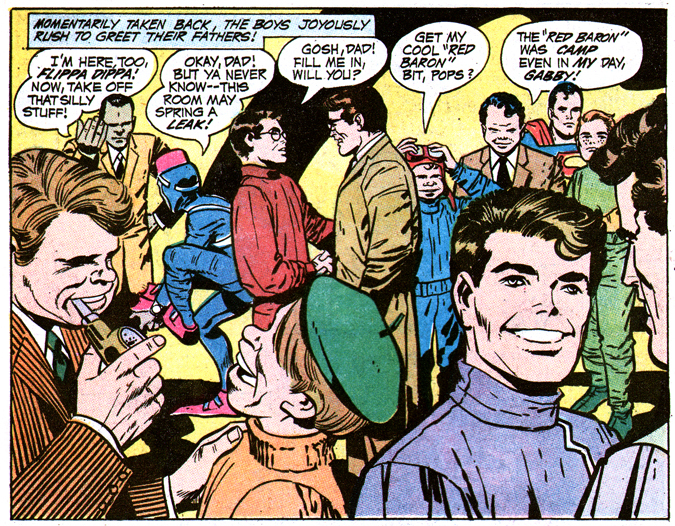 Jimmy Olsen and our kids are with him! Moments later, an armed convoy of battle-trained security troops races toward the alien danger unleashed by a hidden enemy! We see a spectacular panorama of the giant cave that encompasses the main Project complex. Unidentified voices rise from various transports. First voice: There’s no telling what’s happened! Our instruments show they’ve made contact with the alien! Second voice: But the alien is heading for our atomic power plant! All traces of Superman and the boys have vanished! Third voice: Go, men! The Evil Factory has jammed all communications with our atomic power plant! We can’t warn them! All we can do now is pour on the speed! When the convoy reaches an entrance of the fabled “Zoomway” its vehicles switch to jet speed and roar towards where the action is!! Big-Words, Sr.: Our destination lies in the Wild Area, outside of The Project! When we get there, Don’t think! Just act! Time is running out — but fast! Gabby, Sr.: The old Newsboy Legion — the Guardian — and danger — you know, fellas, I’m getting like a lump in the heart!! Scrapper, Sr.: Shaddap, Gabby! If we don’t pull this one off, that lump is gonna be a hole fifty miles wide! Thirteen minutes to destruction! The D.N.Alien, driven by primitive fury and a hunger for radiation, gets closer to his objective — the atomic power plant! He moves without resistance, for those who would stop him are imprisoned in a trap of the alien’s weaving! While Superman, Jimmy and their young cohorts are trapped inside the egg with “a wild atomic structure” and figure out how to escape, we on the outside know there’s only eleven minutes to Doomsday! Closer! Closer! Ahead lies the great source of food on which the Four-Armed Terror can gorge himself! His arms tear out earth, rock and the buried equipment which leads to the atomic power plant! Suddenly, his path is blocked by a thick lead wall! It resists his brute strength! The alien digs! He hammers! But the wall stands! On the other side of the wall, startled workers and security guards converge on the sounds of attack!! But the D.N.Alien is already digging beneath the wall — digging toward his goal — it is nine minutes to holocaust! Superman takes no time to reply! Speed is the answer now! It is seven minutes to fiery end! Like a supersonic dart, the Man of Steel follows the trail of torn rock and metal on the heels of his quarry! After an interlude with Terry Dean and Perry White, we see more wide-angle shots of the Project trooper convoy traveling into the Outsiders’ realm. It is six minutes to disaster! And the fates are gathering the principal players in their death game swiftly together! Voice: This is it! A camouflaged Zoomway exit! Second Voice: We’re entering the Wild Area! Alert the convoy! We’re almost at our destination! Third voice: There’s our kids’ Whiz Wagon! Wherever Superman is, we’ll find them on his trail! Scrapper, Sr.: There’s a tunnel ahead! It looks like the alien is digging his way to the atomic plant! Big-Words, Sr.: Then that’s where Superman and our boys are! Let’s go! Then Mokkari and Simyan, observing the Project forces on video screen, send their army of Four-Armed Terrors into the Dimensional Threshold! Morgan Edge, thoughtfully tipped off by Inter-Gang to get the hell out of Dodge, flies away from Metropolis before the Big Boom! Three minutes to violent eruption! 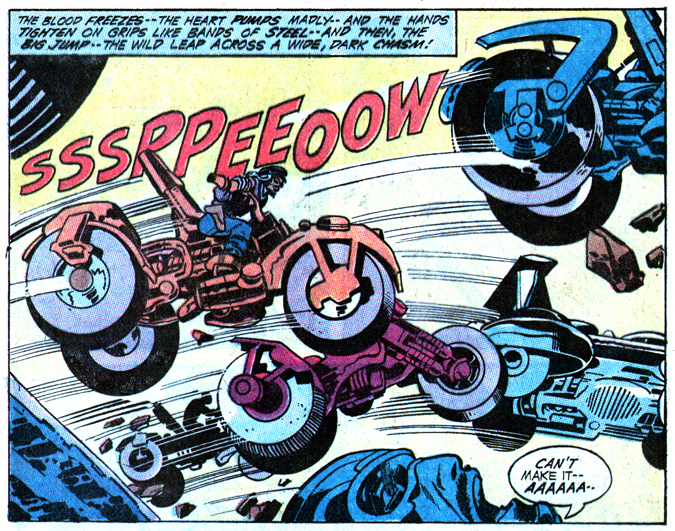 Beneath the blast area, Superman frantically scurries in the wake of the Four-Armed Terror! The reactor begins to run wild! And the alien feeds upon the escaping energy! Superman: Come down from there, you animal! It is one minute to Blow-Up! And it can’t be stopped! 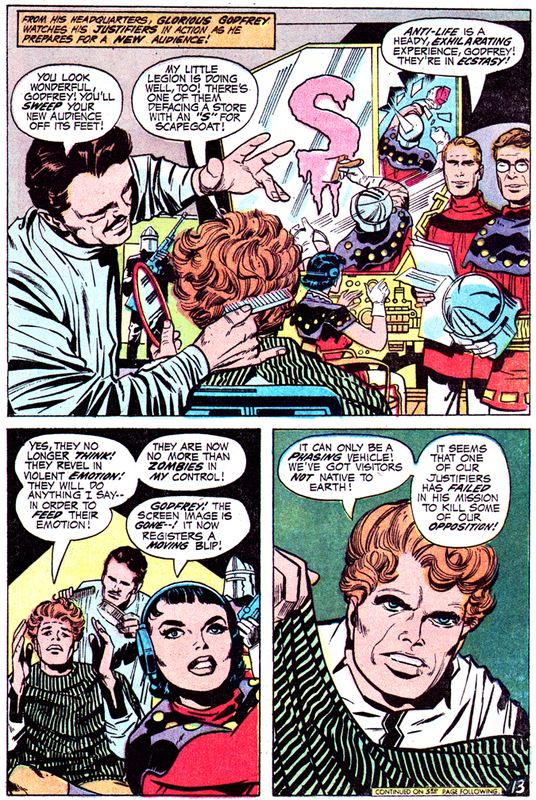 As if to nail down this fact to Superman, the glistening Threshold appears — and from it pours an army of D.N.Aliens! And to meet their charge at this incredible moment, The Project security forces arrive to close in for battle!! Soldier: Open fire! Give ’em all you’ve got! Superman: [Thinking] They’re too late! It’s just about doom-time! Big-Words, Sr.: Superman! We found the boys! They filled us in! — They — Wha–!? The reactor’s reaching critical mass! It’ll melt — flood the area with deadly radiation! Superman: It’s worse! Those aliens could trigger an atomic blast! Are the test tunnels still here? Big-Words, Sr.: Yes! Beyond the reactor chamber! We’ve been planning to tap the Earth’s core for power! Superman: Fine! Now! When I give the signal — halt the firing! Break ranks and let the D.N.Aliens come through! It is thirty seconds SECONDS to eternity! The battle rages in full fury! Superman: Hold them back! Just for one second more! Superman: It’s got to be now! Then he jars the reactor from its foundation! Superman: This is it! Stop firing! Let the aliens through! Let them through! Superman: The aliens are following the trail of radiation — as I’d hoped! I’ve got to use sonic speed now! Superman: The deep core tunnel! And down she goes! Like maddened lemmings, the aliens ignore Superman and hurl themselves after the plummeting reactor!! Superman: They’re blindly following their food supply! Then thousands of feet below, an immense, fiery blast occurs — which sends seismograph needles waving hundreds of miles away! Phew! That was a close one! And, okay, you’re right, the Big Boom is more a non-event, huh? Day 98: S is for Scapegoat! Posted 6 January 2011 in Apokolips, Day Entries, Earth, Events, The Forever People #3, Villains. This entry is a slight departure in that rather than simply replicate Jack Kirby’s captions and dialogue on a given subject, I’d like to editorialize a bit and simply expound on what an innovative and daring aspect the Glorious Godfrey affair was to mainstream culture and perhaps why it’s concepts like this which sets the Fourth World apart from super-hero comics of that era and today. You might think this better included in the “Cooke Look” issue review, but I insist this is a bona fide Kirby concept and quite worthy of its own entry. So there. For my 12-year-old mind, reading “Life vs. Anti-Life” was a combustive experience, igniting synapses throughout a tender brain and motivating me to start thinking about mainstream comics as containing concepts deeper, more resonate, vital even than usually seen. As a youth I certainly was familiar with the underpinnings of this particularly dark aspect of the Fourth World — the persecution of innocents en masse to serve the whims of a death-worshipping tyrant — as an extrapolation of Adolf Hitler’s Third Reich and its war against the Jews and other “undesirables.” That, in itself, was nothing new in comics, where Fuhrer-esque villains and Nazi-like regimes abound, the savagery of World War Two reduced to pulpish melodrama (though the harsh reality of the Holocaust was rarely even hinted at other than depictions of victms being rounded up into concentration camps). But here, with the character of slick, handsome and vainglorious Godfrey, with all his oozing charm, and promotion of an elixir that will solve all of our discontents — Anti-Life, the “Happiness Package” — and the decidedly unpretty implementation of his flowery rhetoric… here Jack was talking about much deeper stuff, things that spoke to his own heritage, his own blood and his own experience. Who are the people “chosen as targets” and “your kind”? They all apparently live in a specific neighborhood in the city and, given the women and children comment, seem to share more an ethnic or racial rather than an ideological distinction. As the unfortunates are loaded into the Aero-Vans (with one pleading, “Help! Where are you taking us?” and a Justifier replying, “Shut up! You’re nothing but animals! Get in that van! Stop shouting and get IN!”), we see a bad guy with clipboard and list telling his comrade, “We’ve got all on this list!” What is the common connection of those being rounded up? As the Aero-Van flies off to Happyland, a Justifier says, “Anti-Life works! We’re justified in ridding the city of this human trash! The city should thank us!” Certainly this indicates that a specific minority is being persecuted. Then there’s the book-burning incident, when a flamethrower-wielding Justifier bursts into a library to order, “Put down those decadent books! Get out of the library! The nonsense stored in this place shall never pollute another mind! You need know no more than the proper things! Who but myself is justified in burning down this library!” Now, becoming a Justifier gives one that “Cosmic Hunting License,” so maybe this ignoramus is just acting on a personal vendetta against literature, but since it’s the second in a series of Justifier acts in the city focused on by Jack, I’m sure it’s an act sanctioned by Apokolips (albeit perhaps to mollify reactionaries in the ranks, which I suspect would be most of ’em!). Especially mind-blowing is to see Glorious Godfrey, sitting in his hairdresser’s chair, being delicately attended to as the preacher, holding a hand mirror, watches a video screen showing his Justifiers wrecking havoc on city business establishments. “My little legion is doing well, too! There’s one of them defacing a store with an ‘S’ for scapegoat!” Weirdly un-ironic choice of nomenclature, given a scapegoat is defined by the American Heritage Dictionary as: “2. A person or group bearing blame for others,” and if your intent is to blame a group, you’d hardly want to advertise the persecuted are stand-ins for the real culprits and themselves not guilty. But though slightly clumsy (and everyone in earshot could possibly be Apokolips denizens who are “in” on the whole scheme, so maybe I’m wrong), we do get Jack’s point and the startling direct allusion to a notorious evening in the late 1930s. November 9-10, 1938: Kristallnacht (Night of Broken Glass) occurs across Germany and Austria. Ninety-one Jews are killed; others are beaten. Thirty thousand male Jews are sent to concentration camps, though most will be released in a few weeks. 267 synagogues are desecrated and destroyed (almost all of the synagogues of Germany and Austria). SS Security Service chief Reinhard Heydrich instructs security agencies to burn the synagogues unless German lives or property are endangered. Jewish businesses are looted and destroyed. There’s absolutely no doubt that Jack, himself of Jewish heritage, was making a not-so oblique reference to Kristallnacht with his “‘S’ is for Scapegoat” incident, astonishing for a mainstream comic book and an inclusion that still floors me. Posted 25 December 2010 in Apokolips, Day Entries, Earth, Events, Heroes, New Genesis, The New Gods #2, Villains. 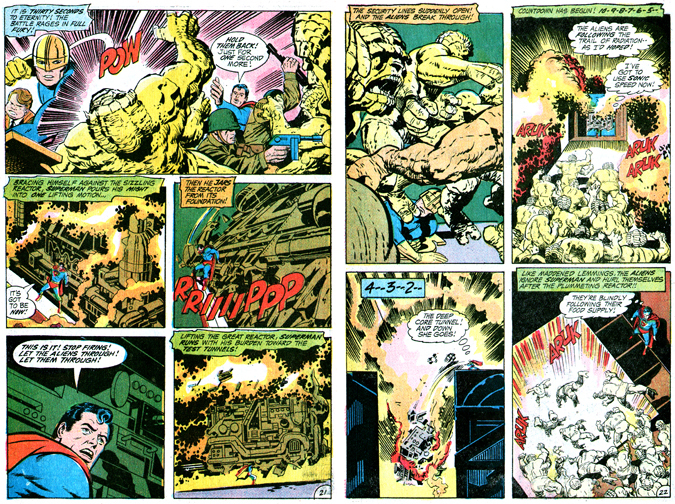 Certainly this setting of a war as backdrop for Jack Kirby’s Fourth World opus is what sets it apart from other interconnected super-hero titles. Marvel’s common connection is the tales are primarily based in New York City — or on Earth — and the characters have some interaction with one another, sometimes joining up as teams, usually to thwart an enemy, who would change from issue to issue. But generally no matter the threat to our planet, conflicts are resolved and everything goes back to normal, all nicely wrapped-up, by the story’s end. We see in the superb “flashback” story, “The Pact,” how the “Great Conflict” — that previous war between the two planets — completely engulfed New Genesis and Apokolips to horrific degrees, rendering both worlds to ruins in a general, all-out war. But the Super War, using Earth as the battleground, is so far a less conventional process, as Darkseid and his agents have established underground network of tunnels, covertly working in shadows, under our radar so to speak. Day 73: The Big Trap! Posted 12 December 2010 in Day Entries, Earth, Events, Mister Miracle #1, Weapons & Devices. Scott gains consciousness as the countdown ensues, thinking, “So! This is the ‘Big Trap!’ — clever — There’s no return from space –!” Then, somehow, seconds before liftoff, Scott is able to manipulate his still-chained hands together — which were stretched out to his left and right, respectively, when we see him chained by the baddies — and generate a crackling electrical charge by touching his index fingers together… (see, Scott Free is a man of miracles!). The rocket takes off skyward and suddenly explodes, and Steel Hand, for the second time, is confident his enemy is finally dead… The relieved crime boss opens his office door to — urk! — find Mister Miracle sitting in Steel Hand’s chair! 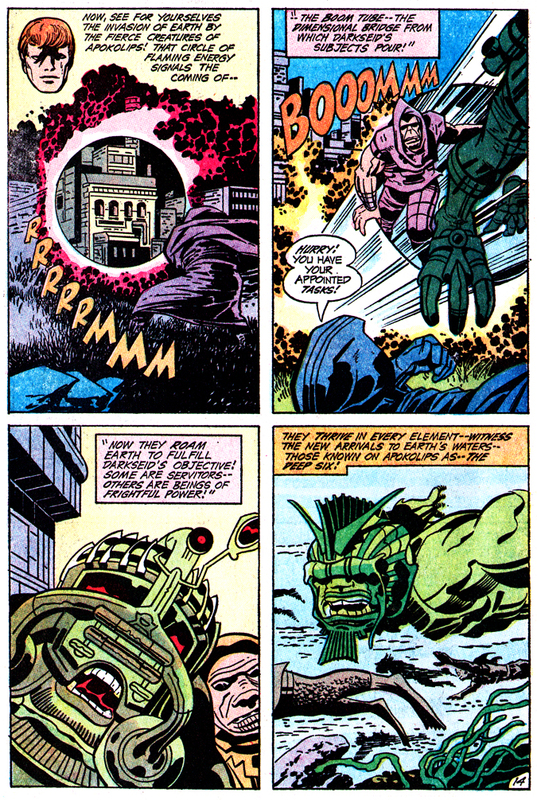 In a rage, the villain completely obliterates his own digs as he tries to karate-chop the dodging super escape artist. 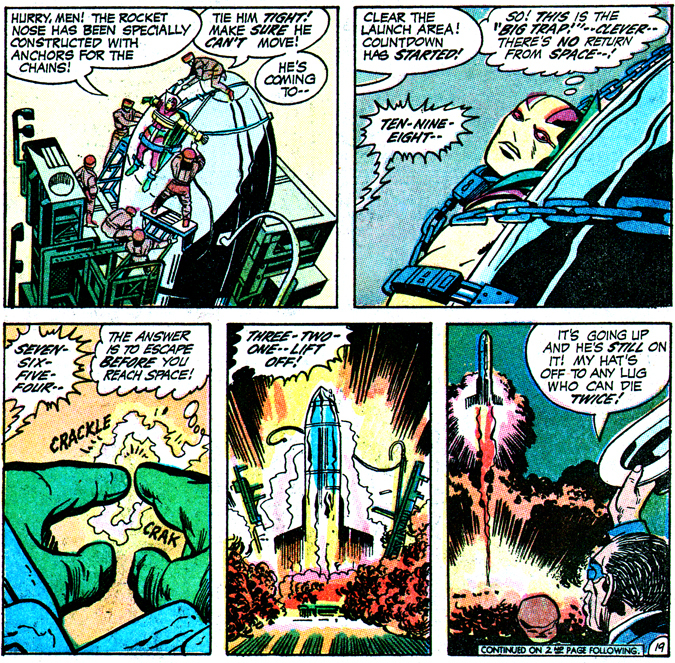 “Now, Mister Miracle,” says the bad guy, “You’ve just about ‘had it!‘ I don’t know how you got free of that missile — But –” Scott interrupts and responds, “I can show you how I might have done it, Steel Hand — I might have hidden Hyper-Sound Intensifiers in my gloves to break the metal chains,” and with a ZZAAAK he touches his fingers together and replicates the effect, only this time zapping his nemesis’s metal appendage! “See what sound waves do to your steel hand!” gloats Scott. Our long-winded hero then pushes a couple of buttons on his midrift which emit air bursts, bragging, “As for beating you to your office — like a lowly squid — I might have used air jets — to shoot myself across the city –” (Well, truth be told, if the ill-appreciated aquatic cephalopod lived in the atmosphere; otherwise it uses water jets, but I’m just being a nudge, huh?) With that, Steel Hand, completely wrapped in the sheets and propelled to the door where law enforcement and Oberon are arriving, Steel Hand is finished and our story just about complete. Day 25: Legionnaires At Ease! Posted 26 October 2010 in Day Entries, Earth, Events, Jimmy Olsen #135, Supporting Characters. A marvelous moment, calm and joyfilled, as the two Newsboy Legions, the old and new, greet one another with affection and delight. Even Flippa-Dippa’s father (this, as is obvious, is a meeting of fathers and sons) is there, who was not a member of the original Suicide Slum gang, but apparently pals around with the guys. Linking the Golden Age kid gang to the present was a splendid touch in not only adding some continuity and relevance to the concept, but it also gave readers a sense of Jack’s own history as a comic book creator through the decades. Always a forward-looking guy, it’s remarkable the artist/writer resurrected characters of a bygone era, so it reveals an affection he held for the boys and their erstwhile protector (whom we will soon learn much more about, Kirby fans!). Enjoy the friendly moment, fathers and sons, ‘cuz things are about to heat up! Day 13: The Big Jump! Posted 14 October 2010 in Day Entries, Earth, Events, Jimmy Olsen #134. Careening down the Zoomway, Jimmy, the Newsboy Legion and the biker gang called “The Outsiders” are heading for the leviathan of the Wild Area, the ominous “Mountain of Judgment.” Watch out, there’s a big gap up ahead! This is where things get lethal, Kirbyheads! 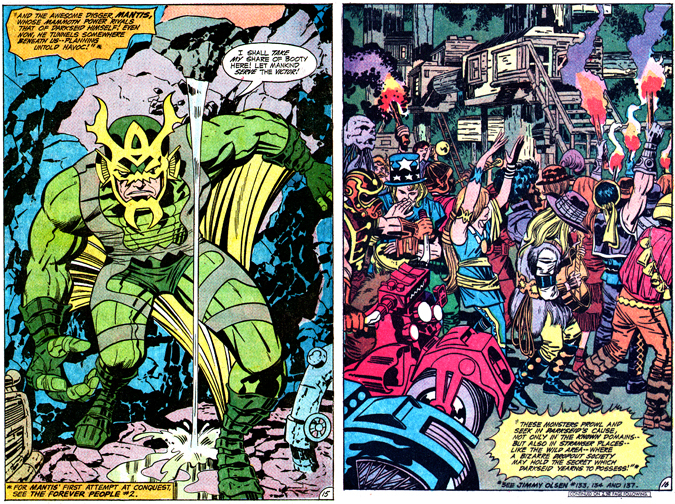 Top 10 Thoughts About Jack Kirby - Comics Bulletin on Day Four: The Wild Area! AverageDrafter on Day 50: Orion! Blog articles are © 2010-2012 Jon B. Cooke. All rights reserved. Comments © 2010-2012 their respective authors. All rights reserved.